The Weingart Center, a Los Angeles-based homeless services organization, was looking for something fresh and inviting for their new website. 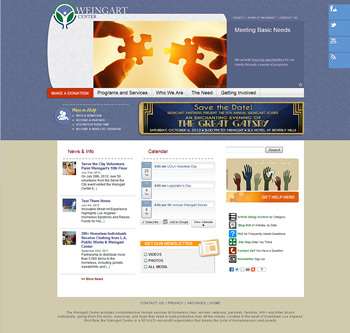 By focusing the Home Page’s narrative to that of donor relations – while still prioritizing social interaction and Center activities – the Weingart Center now, in addition to a leaner and more user-friendly website, has a more potent development tool at their disposal. And with the power of WordPress, their communications staff can now easily and quicklymodify and moderate the website’s content – without heavy reliance on website professionals.